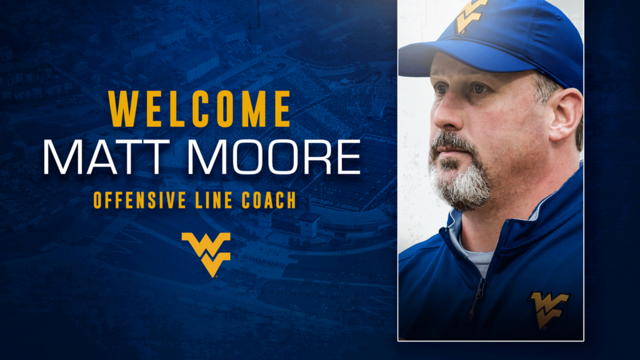 MORGANTOWN, W. Va. - West Virginia University football coach Neal Brown has announced the hiring of Matt Moore as the Mountaineers' offensive line coach. "Matt and I have been together through a lot of football games, and we have developed great chemistry," Brown said. "His offensive linemen are strong and physical, and he has developed some great talent through the years. I look forward to Matt joining us at WVU and getting to work with our offensive line." Moore comes with Brown after serving as the offensive coordinator and offensive line coach for the past four years at Troy. He spent two years on the offensive staff at Texas Tech in 2010-11 and was on the staff with Brown at Troy in 2006. "I'm excited to be joining Neal Brown's staff at West Virginia and become part of the Mountaineer football family," Moore said. "West Virginia is a great University with a successful history and is a member of the one of the top conferences in the nation. This is a great opportunity to continue building young men on and off the field, win games and earn championships." In 2018, the Trojans finished 10-3 and tied for first place in the Sun Belt Conference East Division. Seven players from the Trojan offense earned All-Sun Belt Conference recognition, including three first-team selections. The 2017 squad finished 11-2, won the Sun Belt Conference Championship and had a signature win at No. 22 LSU, snapping the Tigers' 49-game non-conference home winning streak. Moore's offensive line finished No. 6 nationally in offensive line efficiency and No. 12 in fewest sacks allowed. Four Trojan offensive linemen earned All-Sun Belt Conference honors, including left tackle Antonio Garcia, who was the highest selected offensive lineman in conference history. Garcia was selected No. 85 overall in the NFL draft by the New England Patriots. Moore's offense led the Sun Belt in scoring offense in 2016, and finished No. 2 in the league in passing offense and total offense. Troy finished 10-3 and earned its first top-25 national ranking in school and conference history. The Trojans also tied for the nation's lead in best win improvement from the previous year. Troy placed six offensive players on All-Sun Belt teams, including four first-team selections. Prior to Moore's first season at Troy, he spent the previous two years as the assistant head coach and offensive line coach at Louisiana Tech. In 2014, the Bulldogs won the Conference USA Western Division Championship and earned a trip to the Heart of Dallas Bowl. Moore also spent time at Middle Tennessee (OL/2012), Texas Tech (OL/2007-11) and Troy (OL/2006). He began his coaching career at the high school level, producing successful runs in Georgia and Alabama. While at Middle Tennessee, the Blue Raider offensive line ranked No. 2 nationally in fewest sacks allowed. His Texas Tech offensive line paved the way for the Red Raiders to score 28 rushing touchdowns in 2008, second most in school history. The Red Raiders led the country in passing offense, registering 5,371 yards and were No. 4 in total offense with 6,903 yards. With Brown and Moore on the Texas Tech staff together in 2010, the Red Raiders finished No. 7 nationally in passing, No. 15 in total offense and No. 23 in scoring offense. The following year, the Red Raiders ranked No. 7 in passing, No. 13 in total offense and No. 22 in scoring offense. Moore's career began as the head coach at Pickens High in Jasper, Georgia, from 1997-98, before spending the next six years as the offensive coordinator and offensive line coach at perennial powerhouse Hoover High School in Hoover, Alabama. Moore helped lead the Buccaneers to a 77-7 record and three consecutive Class 6A state titles. Moore also served as head coach at North Gwinnett High School in Suwanee, Georgia, before beginning his collegiate coaching career at Troy. A native of Canton, Georgia, Moore played at Valdosta State, starting 34 games at left guard from 1991-94. He earned All-Gulf South Conference First-Team honors as a senior. Moore graduated from Valdosta State in 1996 with a bachelor's degree in health and physical education. He and his wife, Kelly, have three daughters, Tanner, Reece and Sutton.